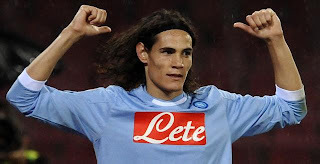 It is reported today that Chelsea are making moves to sign Napoli striker Edinson Cavani. Uruguayan Cavani, 24, is rated one of the best strikers in Europe and showed his quality when he netted three goals in two games against Manchester City in the Champions League. Reports in an Italian newspaper claim that Chelsea have made contact with the agent of the striker and want to clinch his signature in January. With Nicolas Anelka already making a move to Shanghai Shenhua and Didier Drogba away at the African Cup of Nations, Andre Villas-Boas will be short of attacking options. Sources at Napoli say the club are desperate to keep Cavani but they would consider offers in the region of £50m.